How does one build such an enormous containership? The vessels are built in sections which are assembled in the dry dock. Each section can weigh up to 2,200 tons. They are raised by floating cranes with the capacity to lift such blocks and positioned in the dry dock where they are assembled. So the dry dock has to be more than 400m in length. Each section is then welded by experienced welders capable of welding plates up to 8cm thick. In terms of size and equipment, what sort of challenge does this giant of the seas represent? The two main challenges are how to integrate all the equipment into the same vessel and mastering the construction techniques. The big Korean shipyards can meet these challenges because they have adapted their capacities and techniques to the gradual increase in size of the ships they have built. It means they have to make only minor changes for each new size of vessel. However, the challenge would be on a whole new scale for a shipyard which would like to build a ship of this size without having built the slightly smaller vessels. What technologies, particularly regards energy and the environment, have been fitted to this vessel? 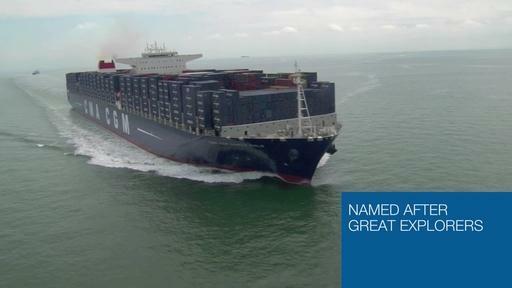 The CMA CGM Marco Polo has all the very latest innovative technologies to protect the environment. Of note is the “exhaust gas by-pass” system which can be compared to a low pressure turbo on cars and improves the engine’s fuel efficiency. We have also fitted a ballast water treatment system. The water is filtered and passed under UV lamps to ensure that no living organism is transported in the ballast tanks to colonize the habitat of local species during rotations. We have also modified the engines to reduce the quantity of NOx (nitrogen oxide) in the exhaust gases. Modifications have also been made to the pipe plan to facilitate use of low sulphur MDO (diesel) in European ports. Finally, from now on the regulation requires calculation of an energy efficiency index and sets maximum values that will gradually decrease (called EEDI or the Energy Efficiency Design Index). The target set by the International Maritime Organisation (IMO) by 2025 is a 30% reduction of the EEDI. The CMA CGM MARCO POLO already meets the 2025 demand with an EEDI value of 10.37, that’s 31% below the maximum value allowed.